5/Al-Ma'idah-83: And when they hear what has been sent down to the Messenger (Qur’an), you see their eyes overflowing with tears because of the truth they have recognized. They say: “Our Lord! We believed (became Amenu)! So write us down with the witnesses”. 5/Al-Ma'idah-84: And why should we not believe in Allah and in that which has come to us of the Truth (in the Qur'ân and the Messenger) while we earnestly hope that our Lord should cause us to enter (Heaven) along with the Sâlihîn (improved people)? 5/Al-Ma'idah-85: So because of what they said, Allah rewarded them Heavens under which the rivers flow, they will abide therein forever. Such is the Reward of the Muhsinûn. 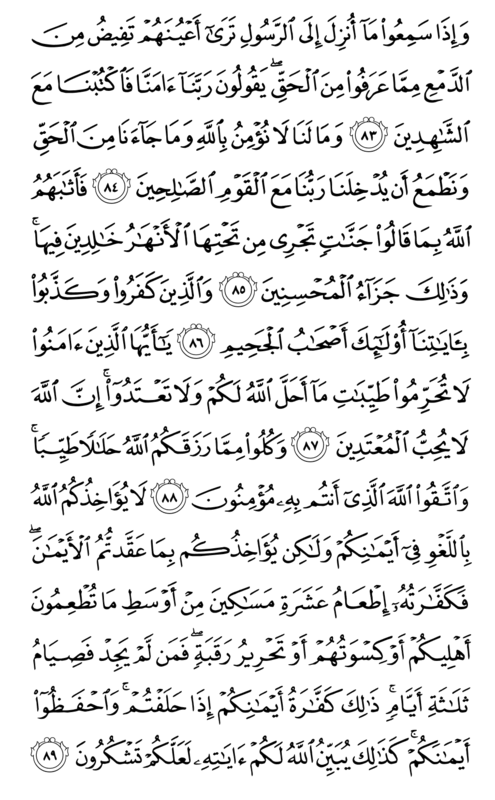 5/Al-Ma'idah-86: And those who disbelieve and deny Our Verses, these are the Ashab-ı Cahîm (companions of Hell). 5/Al-Ma'idah-87: O you who believe! Do not forbid the good and clean things which Allah has made lawful for you. And do not exceed the limits. Verily, Allah does not love those who exceed the limits. 5/Al-Ma'idah-88: And eat of the clean and lawful things that Allah has given you and have piety towards Allah in whom you believe. 5/Al-Ma'idah-89: Allah does not call you to account for what is vain in your oaths. But He calls you to account for the making of deliberate oaths. So its expiation is the feeding of ten needy out of the middling you feed your families with, or their clothing, or the freeing of a slave. But whosoever cannot find these, should fast for three days. This is the expiation of your oaths when you break them (your oath). And guard your oaths. Thus does Allah make clear to you His Verses, that you may be grateful.